One of the movie magazines ran a spread recently about all ofthe "Die Hard" clones. The formula is familiar: Blackmailingterrorists gain control of a high-rise, or let's say, a sports arena, andthreaten to destroy it unless megabucks are transferred to their account. Onebrave man finds out about the plan, and works as a lone wolf to stop them. (Theads almost always end with the dramatic line, ". . . but they didn't counton - one man!") There are a lot of special effects, many fights andchases, and a sensational climax. Finallyit all comes down to a one-on-one between the hero and the villain, preferablyemploying the Climbing Villain Syndrome, in which the bad guy climbs to escape,which doesn't make a lot of sense unless he knows that the movie has to endwith his spectacular fall. "Sudden Death" follows this "DieHard" formula faithfully, with the intriguing switch that it is the herowho speaks with an accent. (Belgian-bornJean-Claude Van Damme deserves credit for transforming himself into an actionstar and improving his English, but it's premature to give his characters WASPnames like Darren McCord.) In the movie's prologue, he's a hero fireman whofails to save a little girl's life. This crushes McCord and leads to hisresignation and divorce. As we pick up the story a couple of years later, he'sa security guard in a Pittsburgh sports arena where the Chicago Blackhawks andPittsburgh Penguins are about to play a hockey match. Thevice president of the United States will be attending the game. An unshavenblackmailer named Joshua Foss (Powers Boothe) plans to invade the VIP suite,hold the vice president hostage, and demand payment of tons of money. Hisdemands also include peace on Earth and the eradication of mini-malls. This isnot a guy without things on his mind. McCordattends the game with his two small children, Emily (Whittni Wright) and Tyler(Ross Malinger). Of course, it's only a matter of time until one of them is inthe villain's clutches. The stadium has been rigged with bombs, and it'sMcCord's task to disarm them, while engaging in fierce martial arts battleswith Foss and his men, and trying to save his child. Thereis a time limit: so many dollars must be deposited in Foss' accounts at the endof every period of the match, or hostages in the VIP booth will be shot. Thepayoff (as the title hints) is that the match goes into a sudden-deathovertime, allowing McCord precious extra minutes to save thousands of lives.Why the timing of the explosion would be delayed by the overtime is notexplained, but never mind: The movie also fails to explain how no one finds itsuspicious that the vice president is never seen watching the game, although itis a well-known fact that politicians attend games primarily to be seen. Ofcourse, "Sudden Death" isn't about common sense. It's about themanipulation of action and special-effects sequences to create a thrillereffect, and at that it's pretty good. The movie has been directed andphotographed by Peter Hyams ("Running Scared," "NarrowMargin" and the Van Damme movie "Timecop"). He's a skilledcraftsman, as you can see during a martial arts scene in the arena's kitchens.The cooks have all been ordered to leave, and McCord gets into a fight with oneof the bad guys, who is disguised inside a Penguin mascot uniform. Theymethodically use every prop in sight: the French fry machine, the hot grill,the meat slicer, the exhaust fan, a jar of hot peppers, the industrialdishwasher, even a bone, which winds up stuck through a guy's neck. A few moreminutes and they would have been gouging out eyes with garlic presses, and shovingtoes into Cuisinarts. Perhapsthe world does not require more than a dozen or so "Die Hard" clones.You tell me. 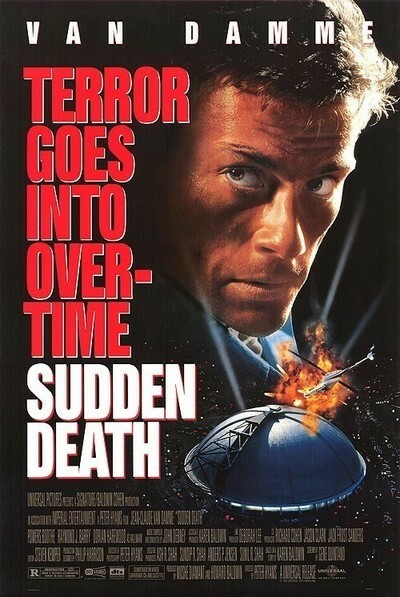 If, in this season of peace on Earth and goodwill toward men, itwould make you feel better to see a thriller in which thousands of hockey fansalmost get blown up, hostages are killed and a guy in a penguin suit gets aone-way trip through an industrial-strength dishwasher, then "SuddenDeath" is your movie.